The Skivvies, Cyrille Aimee, Adam Kantor, Julie Hill, Josh Sharp and Aaron Jackson will join the previously announced headliners Melissa Errico, Liz Callaway, Michael McElroy, Lauren Worsham, Rachel York, Randy Graff, Kim David Smith and Danielle Grabianowski for the fifth annual “Night Of A Thousand Judys” – presented by The Meeting* hosted by Justin Sayre – on Monday, June 1. The Pride concert to benefit The Ali Forney Center will take place at Merkin Concert Hall at the Kaufman Center (129 West 67th Street in Manhattan). Called “a rambunctious, uproarious, unpredictable all-star concert” by The Wall Street Journal, “Night Of A Thousand Judys” will honor the iconic Judy Garland with special skits, tributes and songs from her legendary career as movie star, recording artist and stage performer. There will be a pre-show VIP reception at 6:30 p.m. and the performance at 8:00 p.m. The show is written and hosted by Justin Sayre and directed by Peter James Cook. Lance Horne is the event’s music supervisor, with Steven Jamail serving as music director. Adam Fleming is the evening’s choreographer. “Night Of A Thousand Judys” is produced by Dan Fortune and Adam J. Rosen, with Dan Fortune serving as executive producer. Additional special guests will be announced. A special new episode of Sparkle & Circulate with Justin Sayre – the official podcast of the International Order of Sodomites – features an in-depth interview with Carl Siciliano, founder of the Ali Forney Center, that explores the history and mission of the organization. It’s available on iTunes here, along with previous conversations withRandy Harrison, Michael Musto, Frank DeCaro, Jeffery Self, Kim David Smith and R&B legend Sarah Dash. 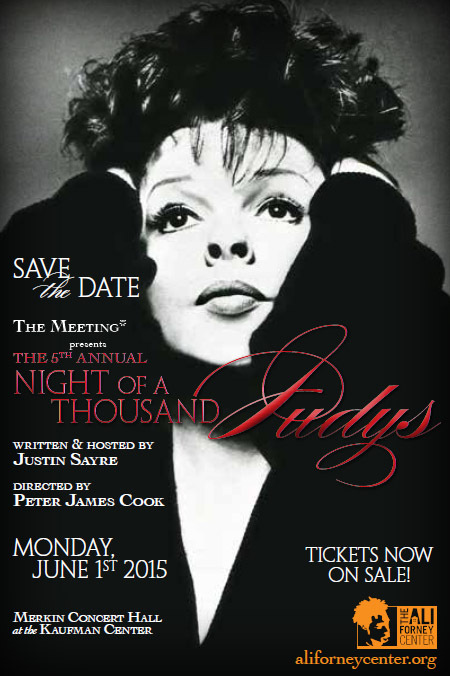 “Night Of A Thousand Judys” is a special presentation of The Meeting* hosted by Justin Sayre, the acclaimed comedy/variety show known for a signature blend of outrageous comedy, politics, culture and everything in between. The Meeting* is currently enjoying a successful monthly run at Joe’s Pub, which hosted of the first “Night of a Thousand Judys” in 2011. The Meeting* – which enjoyed successful runs at the Broadway nightclub 54 Below in New York and the Bootleg Theater in Los Angeles – recently made its Bay Area debut at Oasis in San Francisco.